The children had winter break, the husband's about to turn 40, and I wanted to go somewhere warm - that's right - San Diego wasn't warm enough! How does Hawaii sound to everyone? It was a resounding, "YES!" I mean, how could you not want to go to Hawaii? I did some research and decided to stay at the legendary Kahala Hotel and Resort. It is a gorgeous five star resort tucked away in an upscale residential area - far enough away from bustling Waikiki but close enough to get to if you want to be in the middle of the action. We came here for a lot of rest and relaxation - not to party nor shop. Days relaxing and frolicking on a private white sand beach with the family was exactly what we wanted. The second we arrived, we were greeted with the traditional lei greeting. My not so little girl loved it and proceeded to hula dance with it on. A huge thank you to Kahala for upgrading us to an oceanview room on the 7th floor. It was heavenly to just be in the room. The beds were SO incredibly comfortable that we fell asleep right away every night. We loved sitting on our lanai and just listening to the waves crash in the distance. The shore is protected by a reef so good snorkeling is available just by walking downstairs. The food at the Kahala was phenomenal. Absolutely delicious and service was so incredibly gracious. Traveling with a 16 month old - well, they can be messy - especially since mine is always wanting to feed himself - he's at the "I can do it myself" stage. We never leave a mess for the servers - always cleaning up after the children - I think it's just something our parents taught us....well, the husband got down on the ground to pick up after Christopher and immediately our server ran over and stopped him, asking him to please stop doing their job! They insisted that they didn't mind sweeping up his mess. We loved seeing some very well taken care of dolphins, turtles, bat rays, and fish at the resort - they were all beautiful and all very friendly. Olivia was really looking forward to doing the dolphin encounter with Dolphin Quest and it was worth every penny. We wanted to have her do the "Trainer for the Day" but they only have one slot - so if you want to do it - book it before you get to the resort! Since we traveled from California - the time changed messed with the kids a bit and they were up before sunrise every morning. The sunrises were gorgeous every morning we were there. 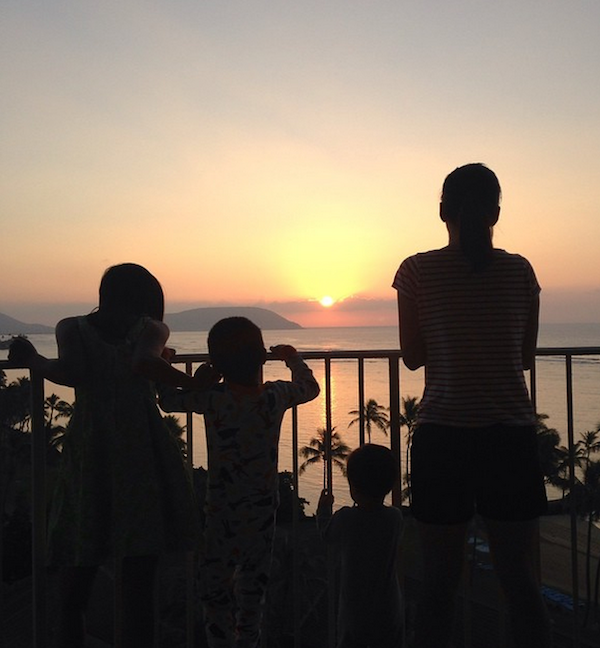 My favorite photo from the whole trip - watching the sunrise with my kiddos. Mahalo Kahala - we can't wait to visit again! When we looking for hotels or resorts we choose tasteful and comfortable accommodations. Every owner of resorts or hotels should keep in mind that. For this, the owners can meet with a consultant to give the newer look of their destination hotels and resorts. All these places are very beautiful and interesting. Gordon Rutty is an expert which is working in real estate for many years.